This is a very pretty digital girl image I created from a little Victorian die cut. 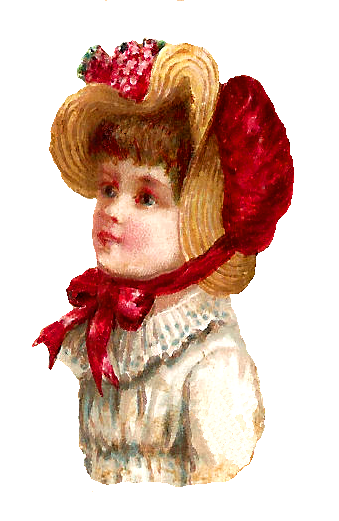 This girl is wearing an incredibly beautiful straw bonnet with red flowers and a red ribbon. It contrasts beautifully with her lacy, white dress. 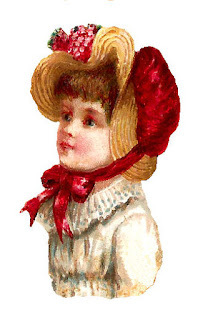 I can image this digital fashion clip art as a design element in an Easter project. When I was growing up, wearing a hat for Easter, plus a new dress, was fun and exciting. However, I never such a grand bonnet to show off. I hope you enjoy this digital child clip art for any of your projects!